We’re always inspired when we see our clients gaining confidence and getting involved. But we’re even more inspired when they go on to encourage someone else in turn. David Nicol is a case in point. When David moved to a new house in 2008, it seemed like a good move. It was what he needed because of mobility problems caused by cerebral palsy. But he soon felt lonely because the new house was so far from friends and family. His confidence took a nosedive and he found himself trapped in the house as a result. Referral to the Ecas Befriending Service and being matched with a volunteer befriender renewed his interest in life. As he became more confident, he and his befriender visited art galleries and museums. He then enrolled on our art group (he still attends). Once befriending ended, he took the initiative and joined various community groups, clubs and a dramatic society. He’s been treading the boards ever since. He then decided that he’d like to offer friendship, in turn, to someone who was finding life difficult. 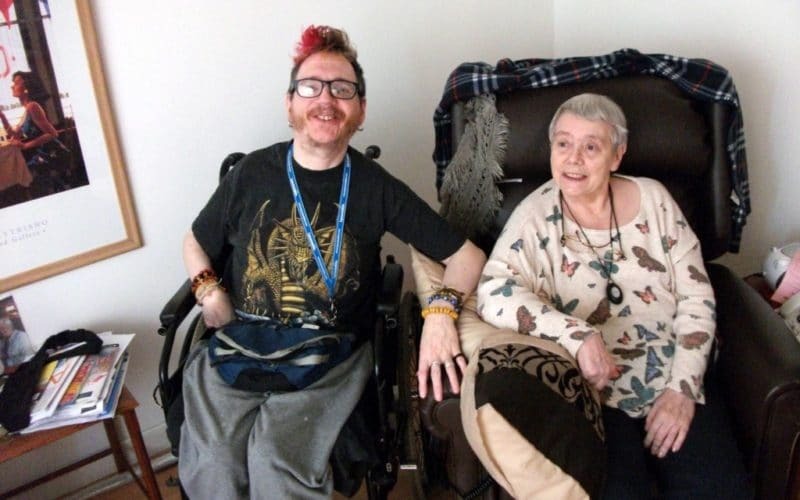 So, he went through our befriending training and we matched him with Margaret because of their shared interest in art and music, tea and laughter. David is now on the board of a disability charity, producing one play for the Edinburgh Fringe, and acting in another! Inspired by David’s story? Find out about our befriending service and volunteering opportunities.